1587 –Mary, Queen of Scots is beheaded today on the orders of her cousin, Elizabeth I, after spending the last 19 years captive of the English. It took the axeman 2 blows, and Mary’s lips continued to move for 15 minutes afterwards. Her pet dog was found hiding in her skirts. 1725 – Death of Peter the Great of Russia. 1740 – The Great Frost, which has gripped London since Christmas Eve 1739, has ended. 1872 – Lord Mayo, the Indian viceroy, is assassinated by nationalists. 1886 – Unemployed people demonstrate in Trafalgar Square, while looting and rioting break out along Oxford Street and Pall Mall. 1904 – Japan and Russia are at war after Japanese warships attacked the Russian imperial fleet anchored at Port Arthur in Manchuria in a surprise night attack. The Japanese sank 2 Russian battleships and a cruiser in the port, trapping the rest of the fleet. The Japanese emperor informed the Russians they were at war only after the battle. 1910 – The inauguration of the Boy Scouts of America organisation. 1924 – The gas chamber as a method of execution is used for the first time in Carson City, Nevada. Chinese gang member, Gee Jon, is given the dubious honour of being the first ‘victim’. 1965 – Cigarette ads are to be banned from British television. 1974 – After 85 days in space, the astronauts on the Skylab space station return safely to earth. 1983 – Top race horse, Shergar, the winner of the 1981 Derby, has been kidnapped from a stable in County Kildare, by Irish bandits who are demanding a £2 million ransom. 1775 – War is imminent between Britain and the American colony of Massachusetts where dissatisfaction over British rule has been mounting for the past 10 years. 1801 – The signing of the Peace of Luneville between France and Austria dissolves the Holy Roman Empire. 1825 – John Quincy Adams is elected US president. 1830 – Charles Sturt, the explorer, has discovered the source of the Murray, Australia’s longest river. 1881 – Death of Fyodor Dostoevsky, aged 60. 1899 – China is in the grip of the Boxer rebellion, led by the ‘I Ho Ch’uan’ or ‘Righteous Harmonious Fists’, known in English as ‘the Boxers’. “If the rain does not fall and the land dries up, it is because the churches stand in the way of Heaven, and the gods are angry,” says a Boxer pamphlet. The rebellion is aimed at Westerners, especially Christians, and the countries of France, Britain, Russia and Germany, which have all forced China to relinquish land. 1971 – The first British soldier is killed in Ulster since the start of the current 'troubles'. 1972 – PM Edward Heath declares a state of emergency in the third month of the miners’ strike. 1981 – Death of Bill Haley. 1354 – In a running street battle with locals, students in Oxford cause death and mayhem. 1567 – Lord Darnley, the 22-year-old second husband of Mary, Queen of Scots, has been murdered. His house was blown up with gunpowder and he was found in the grounds, strangled. He had married his first cousin, Mary, only l8 months ago. Mary’s first husband, the French Dauphin, died when she was 18. Her marriage to Lord Darnley quickly soured, and she sought comfort with her Italian secretary, David Riccio. The jealous Darnley had Riccio murdered in front of Mary, who was heavily pregnant at the time. Mary then turned to the Earl of Bothwell, whom she may now be planning to marry. 1763 – The Treaty of Paris is signed today, ending 7 years of worldwide war, known as The Seven Years War, which began in 1754. Most of the great powers were involved, and it affected Europe, North America, Central America, the West African coast, India, and the Philippines. Britain emerges as the leading world power, gaining Canada and Florida, and establishing its dominance in the East. France has lost its North American possessions except for 2 colonies along the St Lawrence. Spain regains Louisiana, Cuba and the Philippines. With Russia’s withdrawal, Austria’s only choice is to seek peace terms with the victorious Frederick the Great of Prussia. 1837 – Aleksandr Pushkin is killed in a duel. 1840 – Queen Victoria marries her first cousin, Prince Albert. 1840 – 50 years after their separation into separate British provinces, French-speaking Lower Canada and English-speaking Upper Canada are, once again, reunited. 1913 – A relief party has found a snow-covered tent containing the bodies of Captain Robert Scott, Edward Wilson and Henry Bowers, 13 months after Scott and his men disappeared on their expedition to the South Pole. Photographic plates and diaries tell the harrowing story of how they died on the journey homeward, having lost the race against Roald Amundsen’s team. The first to die was Edgar Evans who fell from a glacier. Lawrence Oates, crippled by frostbite, staggered out into the blizzard to give the others a better chance of reaching their ship. But the storm trapped the last three, and they died of starvation and cold. They were only 11 miles from a food cache and survival. 1923 – Death of Wilhelm Röntgen. 1955 – 60,000 blacks are being forcibly evicted from their homes in Sophiatown near Johannesburg by thousands of armed South African police, with bulldozers flattening the township. The Africans are being forced to move to a new settlement called Meadowlands where there are no land rights. 1962 – America and Russia took part in an exchange of prisoners tonight in Berlin. The US spy-plane pilot, Gary Powers, started walking from the Communist side of a bridge, while the highest-ranking Russian spy ever caught, KGB Colonel Rudolf Abel, set off from the American side. Passing in silence in the middle of the bridge, the 2 men walked to their respective freedoms. 1929 – The Lateran Treaty, signed today by Pope Pius XI and the Italian government of Benito Mussolini, gives the Vatican City the status of an independent sovereign state. 1945 – The allied leaders – Winston Churchill, Franklin D Roosevelt and Joseph Stalin – have already mapped out Europe’s future at a secret meeting in the Black Sea resort of Yalta. It was agreed that Hitler’s Nazi forces must accept an unconditional surrender. Post-war Germany is to be split into 4 occupied zones, with Russia in control of the whole of eastern Germany. The invasion of Japan was planned. The old League of Nations will be replaced after the war by a new organisation to be called the United Nations. 1975 – For the first time in its 300-year history, the Conservative Party has a woman leader, Margaret Thatcher, who defeated 4 rivals to succeed Edward Heath. 1983 – Dennis Nilsen is accused of murdering 14 to 16 young men in his north London flat. 1990 – After 26 years in jail for his opposition to South Africa’s racist regime, Nelson Mandela was freed today. His life sentence for treason and sabotage has been unconditionally revoked by President FW de Klerk. 1554 – Lady Jane Grey, the ‘nine days queen’, is executed today at the Tower of London on the orders of her cousin, Queen Mary. 1631 – Dr John Donne, the dean of St Paul’s Cathedral, left his sickbed today to deliver the last of his famous sermons entitled, ‘Death’s Duel’, a brilliant discourse on death and resurrection. 1804 – Death of Immanuel Kant, the German philosopher. 1831 – JW Goodrich of Boston invents the rubber galosh. 1898 – A Brighton resident becomes the first British motorist to die in a car crash. 1912 – China’s boy-emperor, 5-year-old Pu Yi, abdicates, marking the end of the 267-year rule of the Qin dynasty and 3.000 years of monarchy. 1929 – Death of Lillie Langtry, aged 76. She was a British actress, socialite and one-time mistress of King Edward VII while he was Prince of Wales. 1948 – The ashes of Mahatma Gandhi are placed in the holy waters of the Ganges at Allahabad. 1990 – Australia has, for the first time, a woman premier as Dr Carmen Lawrence becomes premier of Western Australia. 1542 – Execution of Catherine Howard, Henry VII’s fifth wife, for treason. 1692 – Robert Campbell and his 128 men have murdered their sleeping hosts, the Macdonald clan, in a predawn attack. The Campbells had sought shelter at Glencoe 2 weeks previous and had been accepted under the strict laws of hospitality in the Scottish Highlands. Last night, Campbell received his orders from England’s Secretary of State for Scotland, Sir Robert Dalrymple of Stair, to “put all to the sword under 70.” Clan chief McIan was slain in his bed, along with 36 of his men and a number of women and children. The rest of the clan fled. The Macdonald chief’s alleged crime was that he had not signed allegiance to the new king, William of Orange. The tragedy is that he had signed, albeit late, having been delayed by blizzards. But this fact had been suppressed by Dalrymple who wanted to make an example of a Jacobite clan for supporting the exiled King James II. 1866 – The James-Younger gang robs a Missouri bank of $60,000. 1883 – Death of Richard Wagner, the German composer. 1917 – Mata Hair, the Dutch spy an femme fatale, is arrested by the French. 1935 – Bruno Hauptmann, an illegal immigrant who fled from a life of crime in Germany, has been found guilty of kidnapping and murdering the infant son of Charles Lindbergh 3 years ago. The judge sentenced him to die on the electric chair. 1941 – Penicillin is used on a human for the first time, a policeman from Oxford. 1960 – The French test their first atomic bomb in the Sahara. 1969 – Human eggs removed from women volunteers have been fertilised in a test-tube at Cambridge University. 1971 – US President Spiro Agnew hits 3 spectators with his golf ball during the Bob Hope Desert Classic tournament. 1991 – A US missile has hit an air-raid shelter full of civilians in Baghdad, killing at least 300. Although allied commanders are claiming that the bunker was a military centre, the row over the number of Iraqi civilian casualties in the allied bombing campaign continues to grow. 1400 – Death of Richard II at Pontefract Castle. 1779 – Death of Captain James Cook, the explorer, killed by a native spear in Hawaii. 1797 – British naval forces under Admiral John Jervis and Captain Horatio Nelson defeat the Spanish fleet off Cape St Vincent, the southernmost point of Portugal. 1852 – Opening of Great Ormond Street Children’s Hospital. 1906 – Suffragettes fight with police outside Parliament, and 54 people are arrested. 1933 – Oxford students declare that they would not fight for “King and Country”. 1944 – Dresden, arguably one of Germany’s most elegant cities, has been destroyed in a firestorm by the most destructive bombing raid of the war. Nearly 2,000 RAF and US bombers pounded the city mercilessly in 3 waves over 14 hours. The city had been considered safe as it was not a war target, and was crammed with refugees. Thousands of civilians died with scores more injured. 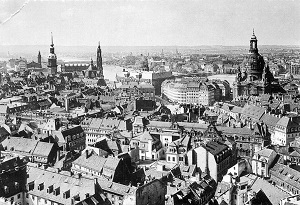 Most of Dresden’s public buildings were considered art treasures, and the galleries housed major art collections. Today the city is a pile of smoking rubble. The head of RAF Bomber Command, Air Chief Marshall Arthur ‘Bomber’ Harris, is facing a storm of criticism over the raid, on humane grounds and strategically. 1973 – A Libyan passenger plane has been shot down over the Sinai Desert by an Israeli fighter plan, killing 74 passengers and crew. 1975 – Death of PG Wodehouse. 1984 – British ice dance partners, Jayne Torvill and Christopher Dean, win gold at the Winter Olympics in Sarajevo. 1989 – Ayatollah Khomeini, Iran’s religious leader, has issued afatwa requiring the execution of the writer, Salman Rushdie, for blasphemy in his book ‘The Satanic Verses’.